You need to floss more often is the advice you don’t really want to hear every time you visit your dentist. But when you see some of things that come out of your mouth when he does a bit of cleaning, you quickly realize you have to change your ways. Then then you remember how messy and uncomfortable it can gets when you use string floss. However, times have changed and you can now use electronic water flossers, which have proven to be easier to use and are lot more effective than their “manual” counterparts. 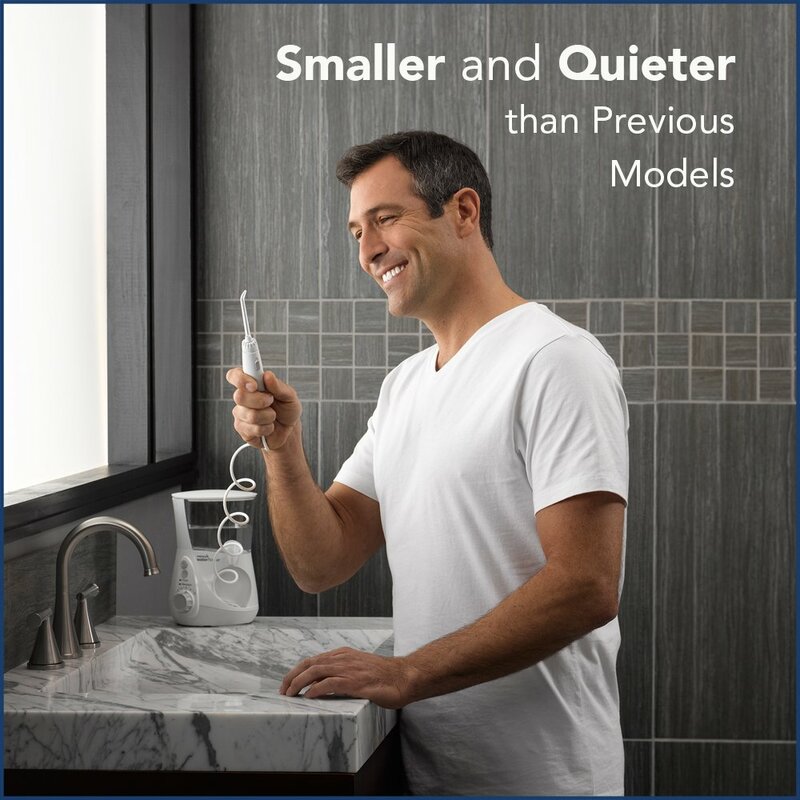 And products like the Waterpik Aquarius Professional Water Flosser Designer Series have actually taken the whole flossing business up another level. 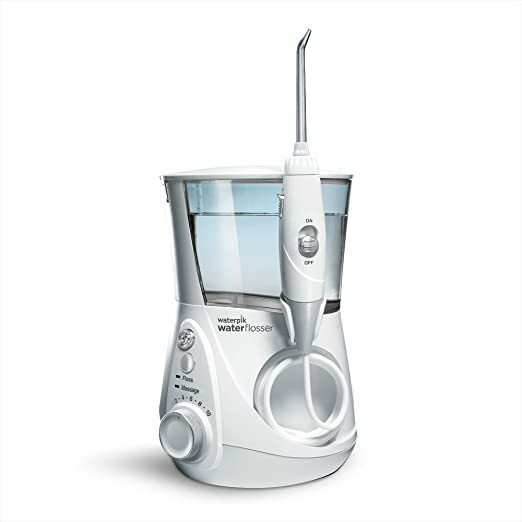 What’s To Like About The Waterpik Aquarius Professional Water Flosser Designer Series? Much like the Waterpik Aquarius Professional WP-660, the Designer Series’ pressure control system also goes up to a maximum of 10. It allows you to choose whether you want the jet stream of water to be fairly thin, which is advisable for children, or more powerful. For those with sensitive gums, it is a good idea to start with a lower setting and see how your gums feel the following day before upping it a notch or two. Of course, the higher the pressure, the easier it will be to get the debris out. Other similarities to the WP-660 model include an on-off water control button on the handle where you start or stop the water flow, a reservoir capacity that should last over 90 seconds and a one-minute timer with a 30-second pacer. Of course the key feature is the two modes. One is the Hydro-Pulse Massage Mode that does exactly what it says: it massages the gums through customized water pulsation and also helps to improve circulation. The other is the Floss Mode, which helps to increase plague removal from the teeth. Another thing the Designer Series has over the WP-660 model is the fact that the LED mode indicators for the Hydro-Pulse Massage feature. But the biggest difference with other models is the fact that it comes in four different colors: Pearly White, Vibrant Teal, Brilliant Black and Radiant Pink. And it also has a satin chrome finish so it doesn’t have that cheap feeling. The handle is replaceable and you can store your tips under the reservoir lid. So What’s Not To Like About It? It’s quite big and you need to find some extra space on your bathroom sink to fit it there. It’s a little difficult to move around while you are busy as the cord isn’t the longest so you constantly need make sure you don’t venture too far away from the base and the electrical cord, unless you prefer to have water splashed all over your bathroom. Although it claims to be quieter than previous models, it’s still pretty loud so don’t for a minute think you will be able to quietly go about your business while someone sleeps in the room next to you. The on-off button can be awkward to manage due to it being on the handle and you can only keep two tis in the storage unit at a time. The reservoir isn’t that big and you often run out of water before you are done flossing. It’s a little more expensive than the olden WP-660 model. Besides the base that comes with the handle, reservoir and water hose, you also get three Classic Jet Tips, one Orthodontic Tip, one Plaque Seeker Tip, one Pik Pocket Tip and one Water Flosser Toothbrush Tip. It’s less than 11 inches in height, when the tip/brush is on, and weighs roughly 1.46 pounds. It’s meant to be an upgraded version of the WP-660 model, but the features are mostly the same. However, if you are in need of a new one it’s a great option as it is smaller and quieter than the previous model. It’s ultimately a very good device when it comes to giving your teeth a proper clean by getting rid of the debris and food particles stuck between the teeth, and it also helps to keep your gums healthy. You can check today’s price here.